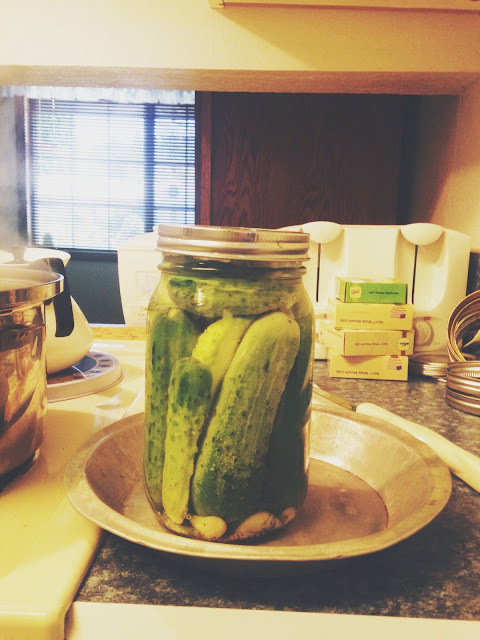 Jarring pickles has become a tradition of the Summer between my Grandma Biggs and myself. It is an all-day venture and our hard work pays off when we open a jar of delicious, home-canned pickles three weeks after canning. 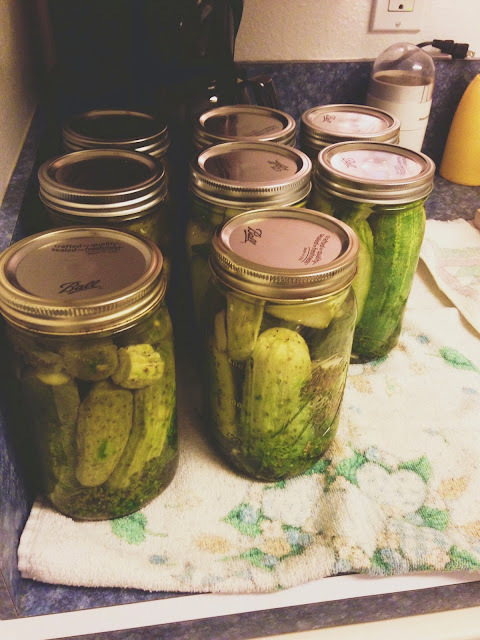 This year, we had my Great-Aunt Bea join us in canning pickles, and since we had three people canning this year, the 40lbs of pickling cucumbers went a lot faster this year than last year with only two people, and 25 lbs of pickling cucumbers. It just seemed to go by a lot faster, I think it helped that we had the procedure down from last year, we were shoving the pickles in the jars, and they were sealing quickly. The process went much faster this year. 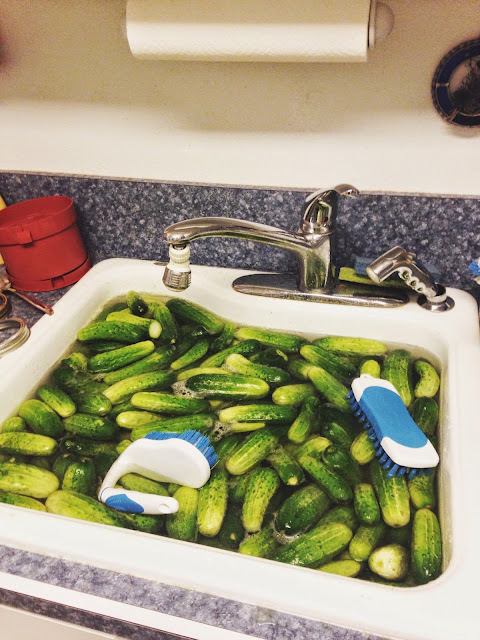 We began with scrubbing the cucumbers. 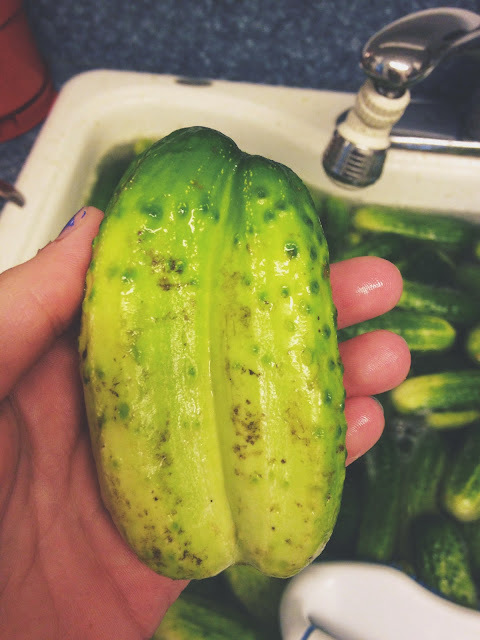 I found a cucumber that was conjoined with another cucumber, and I was about to cut it apart, my grandma started freaking out, "You have to be careful! One could be living off the other's heart, or kidney! This is very complicated! You have to be careful!" She looked very worried. I asked if she was serious and she and Aunt Bea just started laughing. She said "No". It was funnier in the moment, but it is part of the day, so I had to retell it. Both my Aunt Bea and my Grandma Biggs had to go to the store at different times throughout the day because we kept running out of ingredients. We went through five, large, white vinegar jugs for brine. 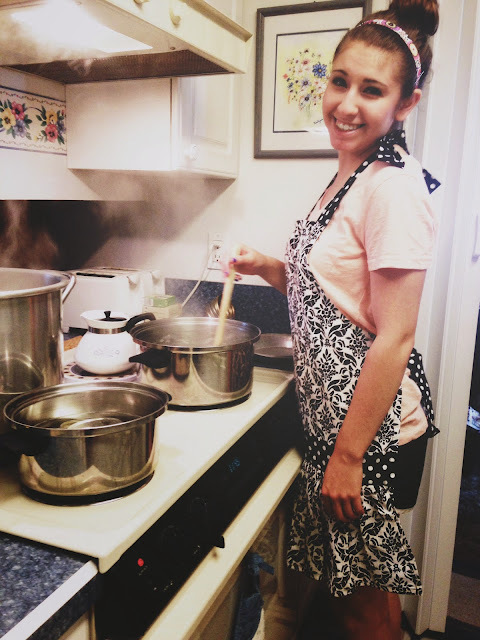 Needless to say, the whole house, plus our clothes and hair smelled like vinegar. Last year, I think we went through three vinegar jugs, which is still quite a lot of vinegar. When you first put all the ingredients in the brine, you have to constantly stir so that the pickling salt and sugar will dissolve quickly. I loved the method we used to sanitize the jars, lids, and rings. 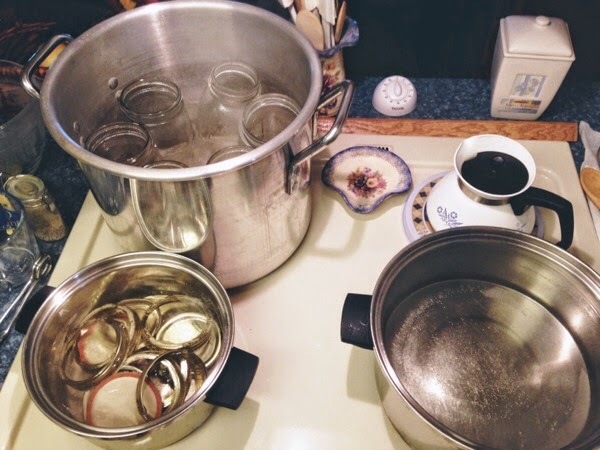 We put the jars in the big pot, and the rings and lids in a smaller pot, and the brine in a medium pot. It was nervwracking taking the hot jars out of the pot, but by the end of the process, it was easy, and we went through the jars so fast. We got used to the heat, the fear of scalding our hands became almost non-existent. The first jar of pickles was completed soon after we got everything going. The part we had to wait on the longest was when we had to refresh the brine, we would have to wait for it to boil again. That was really the only delay. 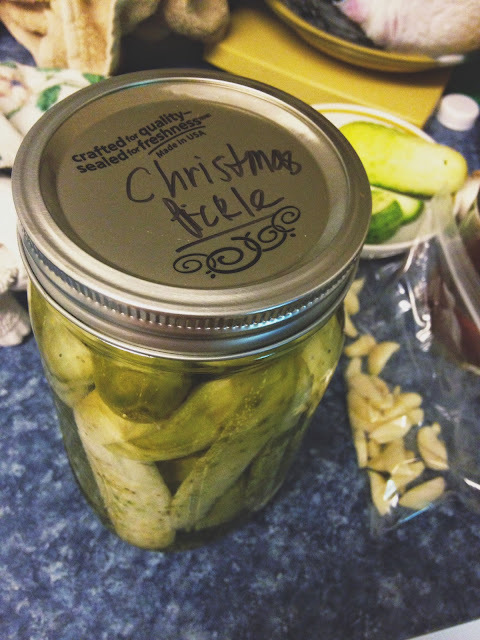 Of course, we had to designate one of the jars for our Christmas Pickles. It is part of tradition. 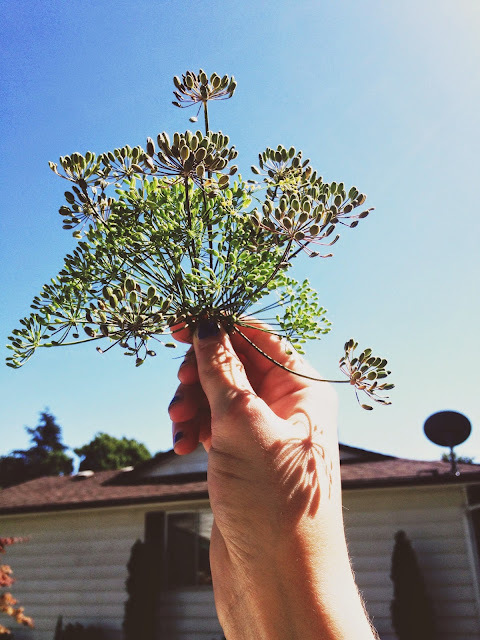 Since we used 40lbs of pickling cucumbers, we used 3 bunches of dill this time. 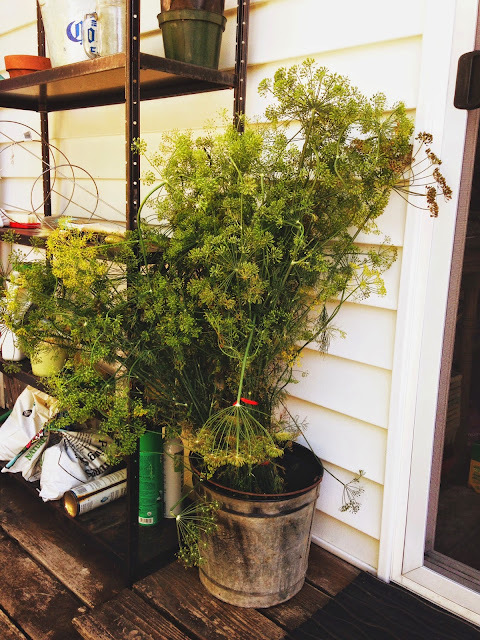 Last time, we ran out of dill, but this time, we had plenty of dill left over. About 6 hours and 37 jars of pickles later, we ended our pickling venture with success and vistory. We used the timer camera to take a picture of us and our pickles. It was a great day yesterday! 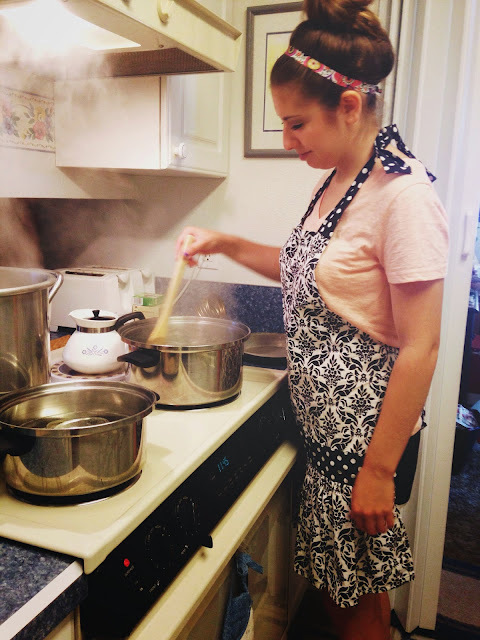 I hope I can come back for part of the Summer next year and carry out the pickling tradition once again. If you would like a step-by-step instructional on how to can pickles, you can read my pickling post from last Summer here. Now I have to wait three weeks for the pickles to ferment so we can eat them. After eating home-canned pickles, I can never eat store bought pickles ever again. 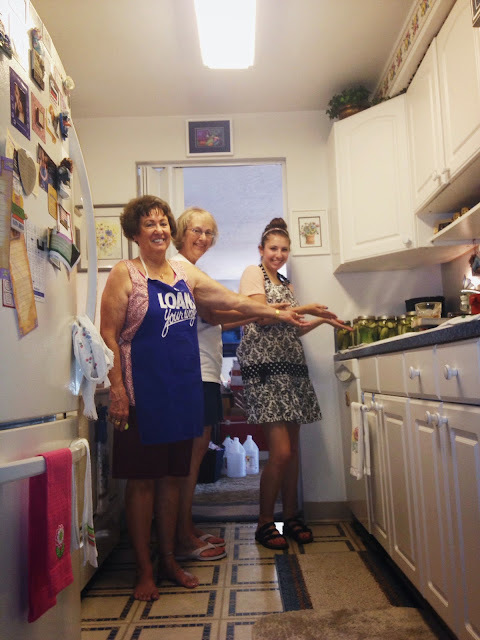 This pickling tradition is so fun, and it is a great way to spend time with my Grandma, and it creates memories to last forever.